Our chef combines Old World cooking techniques with the freshest Vermont farm-to-table ingredients to create seasonal menus that celebrate local Vermont farmers. Built around an indoor boulder, the Dining Room at The Inn at Long Trail has been the source of hearty fare serving skiers for over 50 years. You're going to be hungry during your stay - check out some of the best restaurants Killington has to offer. 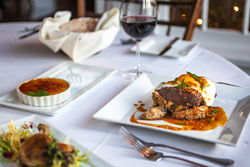 Explore a variety of Killington restaurants, whether you want to grab a quick bite at a Killington cafe, looking for a great Killington pub for a night on the town, or want to hire a local favorite for catering in Killington, VT. 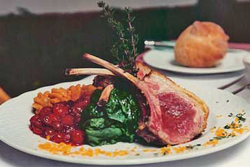 Dining at the Birch Ridge Inn is a perfect way to round out your Vermont experience. Reservations for dinner are recommended. 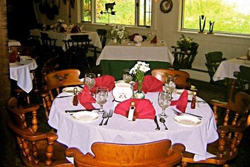 you'll find Red Clover Inn & Restaurant one of the best places to eat near Killington & Pico Ski and Golf Resorts. 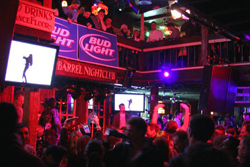 A favorite gathering place since the 1960s, offering 4 bars, 3 levels of entertainment space, 2 stages, dance floors, appetozers and pizza. Located 1/4 mile from Killington's Pico base lodge, the Inn's main dining room is open during the fall and winter months, Thursday though Sunday. Whether shopping for clothes or knick-knacks, skis or jewelry, shopping in the Killington area offers a variety of stores for every interest.